Discussion in 'Christian Advice' started by ChicanaRose, Apr 15, 2019. Ladies: What are your modesty guidelines for your Sunday outfit? Does it not matter because it's the heart that matters? Do you think that your outfit reflects your reverence for God? The most modestly dressed Christian women I've seen have belonged to the Baptist faith tradition. Compared to them, all the others look like lingerie models. I just wear whatever I can. I don't have a lot of money, thus don't own a lot of clothes. What I do have is usually second hand from my sister and she's not a Christian, thus much of it is not church appropriate. Because of that I will often just show up in a modest sweater and jeans. Jeans are not really considered appropriate church wear, but it's better than not showing up at all. God is not interested in how you dress. Rags are fine. Doesnt have to be designer clothes etc! God welcomes anyone and everyone. If you go to churches in Mexico, women wear long skirts. We are not even allowed to wear white shirt with no printing on it because it can be mistaken for an undershirt. There was a day when your Sunday clothes were just your newest clothes. When you got a new Sunday outfit, then the old one became your daily one or was handed down to a smaller sibling. I think modest dress means clean, fits properly, and doesn't call attention to yourself (which leads to pride and vanity). Men are to dress modestly too. The focus is on God, not each other or ourselves. If you find yourself being to concerned with what others are wearing, then it is time to search your own heart. I'm not a "lady", but, if you think about it, your clothes manifest your reverence of God no matter which day it is. Getting all 'modest' one day a week leaves six days of immodesty...by which one manifests no reverence of/for God. When I'm attending vs. overseeing a service, pants, shirt (usually with some sort of giraffe on it), and boots that I can run and stomp through mud and gravel in). I'm a practical person. I don't pay attention to or care what other people wear to church. The main point is that they managed to get up, put something on, and get there. That's really most of the battle when it comes to church-going. Christian advice is defined as advice which contains basic Christian principles that do not conflict with the site's Statement of Faith. We would ask that members direct their responses to the member who started the thread and refrain from debating one another's theological beliefs and viewpoints. Do not use this forum to debate with other Christians as that is not the purpose of the Christian Advice forum. If members would like to discuss/debate specific Christian theological doctrines, they should do so in one of the Theology forums. All advice should be given in the spirit of love and humility, extending grace and respect towards one another in an effort to encourage and uplift the member seeking advice. We would like this forum to remain a safe place where Christians can request advice from other Christians without fear of being attacked. With this in mind, posts that chastise or belittle another member will be deleted and the member may be banned from the thread. Posts that debate rather than advise will also be deleted and the member may be banned from the thread. If you are banned from a thread and would like to discuss the situation with an Administrator, please open a ticket in support. So you really don't have a "modesty guideline"? I suppose if someone walks in with nothing on but a raincoat and spends time going around exposing himself to people, I would most likely have an issue with something like that, but I've personally never seen it happen. The vast majority of complaints about what people are wearing or not wearing in church are just silly and not worth any amount of thought or focus. The point is that they are in church vs. any of the ever-growing amount of other activities they could be doing instead. My general view is that you should do whatever you need to, in order to fit in with whatever Christian Congregation you are in. Now obviously if you are in some cultish Christian Nudists group (no doubt located in California), then the solution there is to find a new group. But generally speaking, you should look around your church, determine what is acceptable, and fit in. Be part of the fellowship of believers. If your dress is more important than being part of the group, then I would advise you to find a group that is suitable, that accepts the type of dress you wish to wear. On a personal note, I think it is more important to fit in, and be part of the group, than finding a group that you fit into. I think it is a good sign of character to be willing to set aside your personal preferences to join the body of believers. But on the other hand, moving to a new group might also be just what you need in your life. It's just something a Christian must wrestle with. LOL I don't know...maybe a Christian Nudist group would be the most modest of all, provided that they aren't making up by wearing expensive jewels and fancy body paints. So having been all over the internet.... It's a funny idea, but no... a naked chick with paint, is still a naked chick. Of course that too would likely be something we could find in California. A church of body painters. I suppose costuming would be pretty easy when it comes to Christmas or Easter skits. So my previous reply got deleted. And for good reason, it seems. Fair enough, rules are rules. In the Catholic world, modesty is meant to be an important thing. The faithful should dress well and dress modestly. The Vatican has a dress code. And it is enforced, believe me. 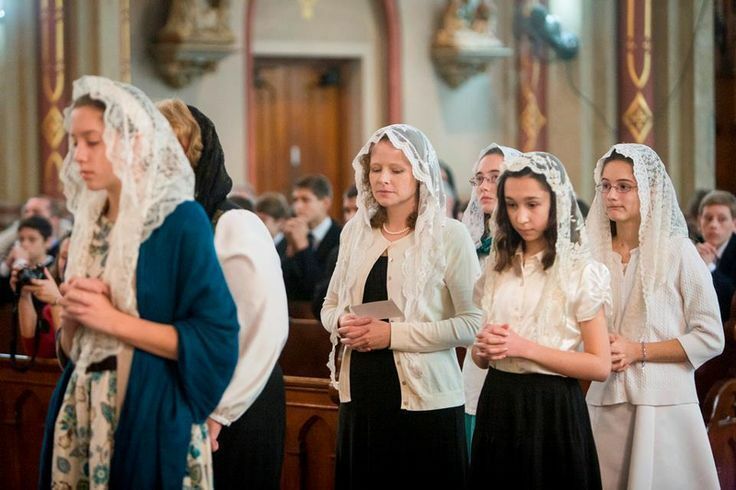 The veil that particularly trad Catholic women wear is meant to honor them. Veils are not a matter of faith so wearing them is optional for women. But it's no bad thing to have them as they're showing a reverence for the Lord in a very unique way. I usually wear a dress or a skirt, but I am Pentecostal, so I think it would just go by the guidlines set in your church. I have to ask...is your level of modesty dependent on which day of the week it is? No, I wear skirts and dresses in and outside of the church. I grew up wearing skirts and dresses, so I feel most comfortable with the standard that my mom and church taught me. I think it would be hypocritical to be modest in church, but not be modest outside of church.